If at Camp Pet-O-Se-Ga you feel like singing Kumbaya around the campfire, go ahead. You won’t be the first. The Emmet County park at the west end of Pickerel Lake started out as a summer camp with boys sleeping in log cabins, eating in a mess hall and spending their days learning archery, canoeing, hiking and swimming. When the County Board of Commissioners purchased the land in 1992 they decided to create a new place to camp during the summer but preserve the history and ambiance of the old summer camp. Camp Pet-O-Se-Ga dates back to 1934 when Jim Templin, a 23-year-old graduate of University of Kentucky and former Eagle Scout, decided to postpone his business career and open a summer camp on 55 acres of abandoned property where Cedar Creek flows into Pickerel Lake. Templin eventually expanded his facility to 300 acres and 19 log buildings, creating a camp that hosted 100 boys. 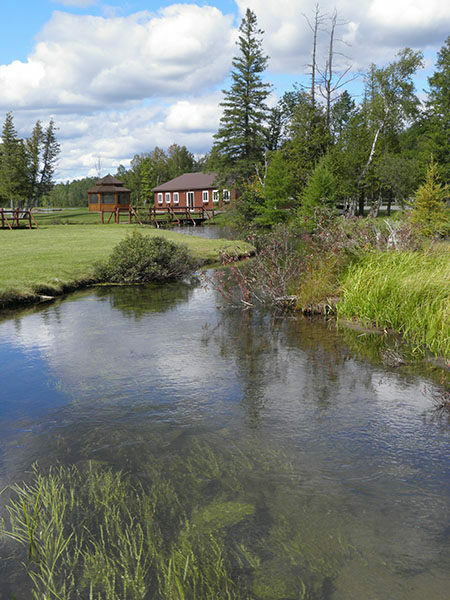 Templin sold the camp in 1954 but returned after Emmet County purchased the property and organized an alumni group that refurbished the remaining cabins. Today several are available for rent while another serves as a camp museum. 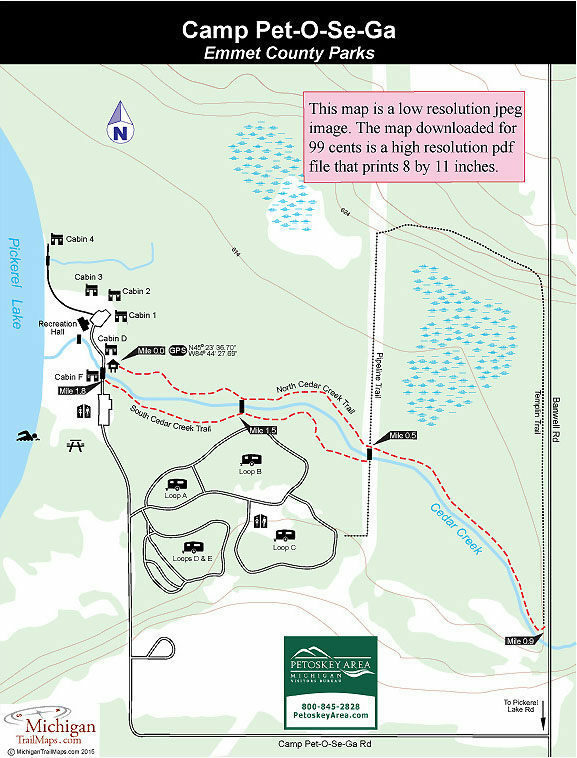 The most popular feature of Camp Pet-O-se-Ga is its modern campground with 90 sites, including five full hook-up, pull-through sites, scattered along five loops. At one time the park had several miles of nature trails. But currently the best maintained paths are North Cedar Creek Trail and South Cedar Creek Trail which can be combined for a loop of 1.8 miles from the day-use area to Banwell Road. Two other trails, Pipeline and Templin, can also be followed but they are poorly marked and used mostly in the winter by snowshoers and Nordic skiers when the trails are groomed. The North Cedar Creek Trail is posted on the north side of the park road bridge where it immediately enters the woods as a wood-chipped path and begins skirting this lovely trout stream. You stay within view of the creek for most of the hike and along the way will pass a handful of wooden benches where you can sit quietly and look for the telltale rings of trout actively feeding on insects. Within a quarter mile you arrive at the first of two bridges across the stream and at Mile 0.5 arrive at the second. Here the Pipeline Trail, which appears as a utility right-a-way, heads north. North Cedar Creek Trail continues to skirt the north bank of the stream but becomes a much more challenging trail in the woods, a narrow path that is occasionally too wet to follow in the spring or after a heavy rainfall. It remains near the creek until Mile 0.9 where it arrives in view of Banwell Road. Here Templin Trail heads north, closely paralleling the road. Backtrack to the second bridge and cross it to the south bank of Cedar Creek. The Pipeline Trail heads due south here to the campground while South Cedar Creek Trail continues east along the trout stream. 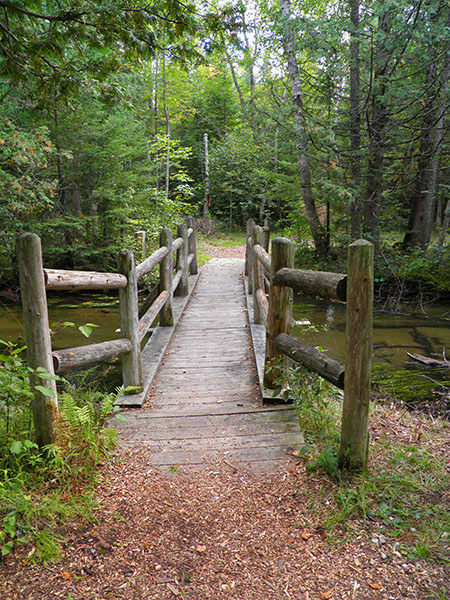 The first bridge is reached at Mile 1.5 and the trail ends back at the park road at Mile 1.8. Camp Pet-O-Se-Ga has 90 sites spread across five loops that are well equipped to handle recreational vehicles. All the sites are wired for electricity and almost half of them feature water as well. Yet despite being a modern campground, the sites are well spread out in a pine and hardwood forest, where campers can enjoy a wooded and private setting even on a busy weekend. Sites No. 86-90 are pull-through with full hook-ups that include sewage while scattered throughout the campground are 10 barrier-free sites. The county park also has six cabins available for rent. 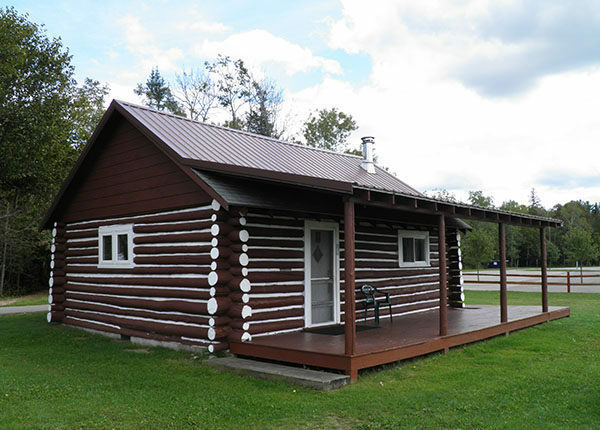 The two most popular cabins, however, are classic log structures that Templin built for his camp and then refurbished for Emmet County. Both feature electric lights, kitchen areas with refrigerators and stoves, fieldstone fireplaces and a front porch that lets you relax with a full view of Pickerel Lake. The most unique part of the park, the area that makes you feel like you’re back at summer camp, is Camp Pet-O-Se-Ga’s waterfront. It’s an open, grassy area bordered on one side by a sandy beach and Pickerel Lake and on the other by a string of cabins and the old mess hall. Flowing through the middle is Cedar Creek. In the back of one of the large cabins is a small museum with historic photos of the summer camp and display cases filled with uniforms, badges and camp song books. The cabins are rented year-round while the campground is open from early May to mid-November. The campground can be a popular place on weekends during the summer; it’s best to reserve sites in advance if possible by call the park office at (231) 347-6536. From I-75 in Mackinaw City depart at exit 338 and then turn west on Central Avenue. Follow Central Avenue for 2 miles and then turn south on Wilderness Park Drive. The park entrance is reached in a quarter mile. For more information contact the Camp Pet-O-Se-Ga park office (231-347-6536; www.emmetcounty.org/petosega/). For travel information contact the Petoskey Area Visitors Bureau (231-348-2755, 800-845-2828; www.petoskeyarea.com).